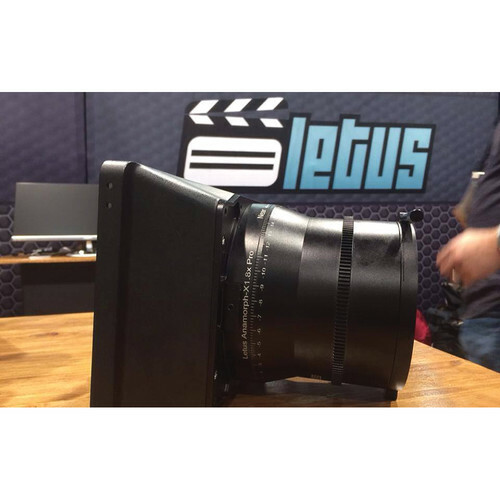 The high flare AnamorphX-PRO 1.8X Adapter from Letus35 allows the conversion of spherical prime and zoom lenses into anamorphic format. The adapter forms nice oval bokeh that is unique to anamorphic lenses and flares without image color aberration. The device features a 1.8x squeeze, which will work with all current 4:3 cameras, bringing it to a standard ratio of 2.39:1. The adapter is equipped with a 1/4"-20 thread hole for lens support. The mounting solution included is for 114mm outside diameter lenses. Separately available adapting rings will fit smaller lens diameters, like 77mm, 82mm, 95mm, 104mm, and 110mm.